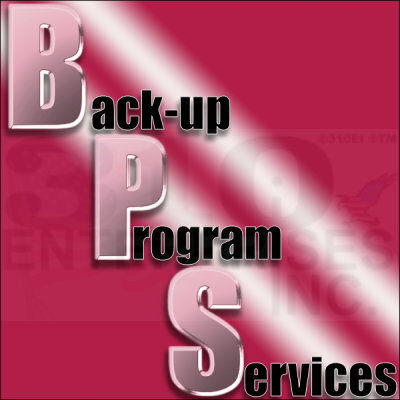 Back-up Program Service - 310 Enterprises, Inc. Most of us are familiar with using Windows Explorer to copy/paste files; a very tedious and time-consuming job when you have hundreds, or thousands, of files you want to preserve. Not to mention that when you try to copy/paste large amounts of data it can cause Windows to lock-up. We setup and configure DOS POWERED commands in Windows to preserve your data that is quick and efficient. After we setup what folders and files you want saved from your computer, you double-click on a backup icon and let it do the rest. We use this method for our customers and they love the simplicity and efficiency of the program. We have three computer towers in our office and they are networked together. When I double-clicked on the backup icon, it saved 43,821 files from 1,348 folders from all three towers in 84 min. That was a total of 19.7 GB of data. To save all of that data via the old copy/paste method would have taken approximately 3.0 hours. Best of all, I didn't have to baby-sit the process which meant I was able to spend my time elsewhere. When I ran the program again, it copied only the NEW data I had added to various folders and the process took only seconds to complete. It actually scans through all the folders and takes only the new files to save to the external hard drive. ATTENTION: If you move folders or files to a different location on your computer hard drive after having run this program the first time and then run the BkUp-01 routine again... it cannot differentiate those changes and it will inadvertently create duplicate files in your destination. The original backup copies will remain as they were when saved, and the newly-moved files will copy again in their new locations. I have an external hard drive that I save copies of my files to and what I do when I've moved files/folders on my main computers is delete the entire BkUp-01 folder that was created on my EHDrive. I highlight the BkUp-01 folder on the EHDrive (where my backup files are located) and then press the SHIFT + DEL keys together. By using this keystroke combination, I avoid moving it to the trash bin where it has to be deleted again to get rid of the old files. SHIFT+DELETE removes the files completely, in one set of key strokes. Now I'm ready to double-click on the BkUp-01 routine icon that is located on my Desktop. Once the backup is complete, I have an exact duplicate of my selected files, determined in the setup of the backup routine, saved to my EHDrive.